From Munich to Toronto, passing from London and San Francisco we are facing an affordability crisis in the property market: despite mounting prices, average local income in respective areas lags behind in terms of growth rate. The divergence has ruled out the chance for many to buy a house in one of the main financial centers and rents have been accounting for a bigger and bigger consistent share of income. At the top of this crisis we find Hong Kong: here we find the highest price-to-income ratio worldwide. With an average income of HK$375,000 (US$48,000 approximatively), even those who earn twice the income have troubles, given the 22 years of work needed to afford a 650 square-foot (60 sqm) apartment in the Asian metropolis. Ten years ago, these years of work were only 12, and currently the ratio is expected to grow. Data are striking: in the last ten years, prices not adjusted for inflation have reached an outstanding +191.5%, taking off with double-digit increases from 2008, as capitals started to flow to emerging economies. In the last five years, a general increase of prices has taken place broadly, thanks to easy financing environments both in Europe and in the US, with UBS analysts quantifying it around 35%, nonetheless Hong Kong has outperformed any other city. The trend in the last four quarters is not sensibly different, with an increase of 15.9%. A growth slowdown has been registered in the last six and three months rates, accounting respectively to 10.4% and 5.2%, according to Knight Frank’s September Report. In August the market slightly fell, reporting a negative 0.076% by the estimates of the territory’s Rating and Valuation Department, that puts an end to a 29-months bull run; however, Knight Frank still predicts an overall annual increase of 10-13%. The cause of such a bullish market has to be found in the buoyant demand from wealthy investors, 95% from mainland China. Expectations of still higher prices paired with low interest rates may have sounded a fair investment opportunity for capitals hedging from renminbi exchange rate, moving to the more stable Hong Kong dollar, which is pegged to the US currency. Against this huge demand, the strongly undersupply of houses present in the city led the prices to skyrocket. The prices’ peak ranked the city first in the annual UBS Global Real Estate Bubble Index, with a score of 2.03, well above the threshold of “bubble risk”. This is defined as “a substantial and sustained mispricing of an asset” and the signs the Swiss bank acknowledges as indicators of a bubble are all present in Hong Kong: easy lending, divergence of prices from income, construction activity. The index, analysts say, is however not accurate in predicting if or when a burst will happen. Major signs of prices slowdown are now evident in Sydney and Stockholm, yet in Hong Kong future movements are hard to predict. August small drop may prove the verge of an exaggerated market or an irrelevant faux pas in the consolidated trend. In case expectations are not met and a sudden shift in general sentiment happens, the whole segment will undergo a significant shock resulting in high capital losses for households and investors. Measures have been taken to prevent such event to happen suddenly: the Government is at the forefront to encourage a gradual cooldown. As far as policies against housing demand are concerned, vacancy tax on immovables and a 30% stamp duty on foreigners have been introduced, alongside with the restriction of borrowing more than 50% of the amount to buy luxury apartments. Interest rates have been raised several times from 2017, and a currency pegged to the US$ implies also increases in rates in the US must be followed. Projects have been set up to foster supply too: land reclamation is one hypothesis, building an artificial island that could provide up to 400,000 homes for 1.1M people. However, first blocks will be available only in 2032, failing to meet ever-rising market needs. 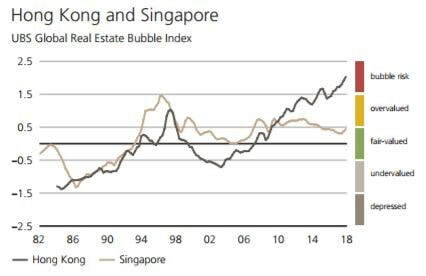 In my view, as soon as demand will stay as high as today, taking into account current and short-term supply, we will not assist a spectacular crash of the Hong Kong housing market. The growth has indeed slowed down thanks to monetary and housing measures implemented by authorities; still, a trend inversion seems quite unrealistic. Moreover, if we look at the current Chinese uncomfortable international position, capitals outflows are likely and a safe port as Hong Kong may still be a valid alternative.